Agency workers regulations – could you lose out? 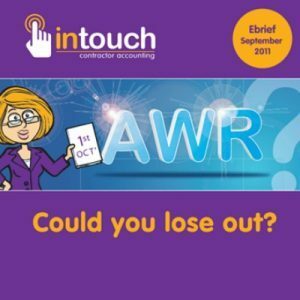 AWR – could you lose out? By now you’ve probably heard the abbreviations AWD or AWR, which are often used interchangeably – AWD being the Agency Workers Directive and AWR, the Agency Workers Regulations. But, do you know what it’s all about and, most importantly, do you know if it affects you and, if so, what actions do you need to take to reduce the risk of losing out on that key contract? In this ebrief, Paul Gough from InTouch Accounting, the personal online accounting adviser for contractors and freelancers, explains more about how the changes coming into force on 1 October 2011 may affect you, as a contractor, and he looks at whether now may be the time to move from an umbrella to a limited company. From 1 October, and after a 12 week qualifying period on a contract with the same hirer, according to the AWR, a temporary worker will be entitled to the same basic employment rights as their permanent comparable counterparts, in relation to pay and other basic working conditions, such as annual leave, night work, rest periods, working hours and rest breaks. So, who does the AWR affect? If you’re currently working through an umbrella company then you can expect your pay to be the same as if you’d been recruited directly by the hirer, or as paid to a comparable employee. If you receive part of your pay as a reimbursement for travel costs, then this can form part of your overall pay. In the months following the introduction of the AWR, it’s likely that many agencies and clients will not fully understand the legislation, and it’s possible that contractors could gain a competitive advantage if you can demonstrate that the regulations do not apply to you, as someone who is outside of IR35.